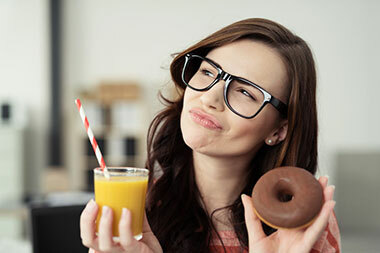 Sugar Hurts Teeth: Do You Sip and Snack All Day? Sugar Hurts Teeth: If You Sip and Snack All Day, You Risk Tooth Decay! As hardworking and productive members of society, we all deserve a little reward from time to time right? Whether it be the daily grind of working nine to five, or the rigorous duties of parenthood, a well-deserved reward always makes seems to make thinks a little more enjoyable. However, for many people this so-called guilty pleasure often takes the form of treating themselves to sweet tasting snacks or beverages. While it’s certainly okay to partake in enjoying a bit of sweet flavored candy every now and then, if this becomes a regular daily habit, you may find this habit causing a bit more pain instead of pleasure! Did you know … sugar hurts teeth? Sugar Hurts Teeth: A Truly Rotten Problem! As its name implies, tooth decay refers to the condition in which the build-up of acidic material in a person’s mouth causes the outer layers of their teeth to slowly begin to dissolve. With the loss of its protective outer coating, the tooth is left vulnerable to the excess plaque and bacteria within the mouth, causing the tooth to break down and begin to rot. While the idea of a rotten or missing tooth may sound unappealing, what truly makes this an urgent problem are the infectious complications that can occur as result of tooth decay. When a serious oral infection occurs, there is always the potential for the excess bacteria to spread to the bloodstream reaching regions of the body. This can cause severe damage and can even be life-threatening if left untreated. As you probably already know, there are certain types of foods that are worse for your teeth than others; however, there are indeed certain snacks that can absolutely decimate your oral health if consumed in excess. Hard Candy: As strong as your teeth might be, excessive hard candy (such as lollipops, peppermints, and jawbreakers) can be the kryptonite to your pearly whites! In addition to being packed full of cavity-causing sugar, (and we know that sugar hurts teeth!) the candy’s hard material can also cause cracks and chips to form in your teeth, requiring an emergency visit to repair. This can also be said for ice, which although not candy, can very easily break or damage teeth. Heed our advice; please DON’T chew ice! Soda/Soft Drinks: Although soft drinks such as Coca-Cola or Pepsi products are moderately priced and highly accessible, with their high acidity these various sodas can slowly eat away at the enamel of your teeth, making them increasingly frail and vulnerable to decay. Citric Fruits and Juices: While fruits and their juices (oranges, limes, lemons, grapefruit, ect) certainly provide some great health benefits, their highly citric nature can be hazardous for your teeth and cause painful sores to form within your mouth. Although this surely doesn’t mean that you should avoid fruits all together, but just to be mindful of some of the negative affects that they can cause if consumed too often. Hard or Crunchy Food: Although crunchy snacks like chips, pretzels, crackers and other assorted items are beloved snacks that have been enjoyed by people for many years; these starch-rich snacks are not exactly kind to your teeth. Due to their highly breakable composition, these snacks often find their way into the various crevasses within your teeth. Once the food particles have become lodged within your teeth, excess plaque begins to build and cause decay. If crunchy chips are your snack of choice, taking the time to floss regularly is a wise idea. Coffee / Caffeinated Drinks: Okay, this is a tough one for many people to accept, but caffeinated coffee, tea, or energy drinks, are not good for your teeth. Although caffeine certainly helps you stay awake, it also dehydrates you, causing your teeth dry out and decay. While this might be unwelcome news to those who depend on their caffeine kick do get them through the day, our advice to caffeine users would be to reduce sugary add-ons and supplement your caffeine intake with plenty of water. Sticky Candy: According to many industry insiders, chewy or sticky candy holds dubious distinction as the worst snack for a person’s teeth. Much like its harder-candy counterpart, sticky candy such as jolly ranchers, gummy bears, and taffy are rough on your teeth due to their extremely high amount of sugar. (Remember?!?! Sugar Hurts Teeth!!) However, what truly makes sticky candy the worst of the worst is its uncanny ability to get stuck in the small gaps and crevasses among your teeth, and its difficulty to be removed once caught there. Because of the sticky materials’ ability to get stuck within your teeth and the sugar within it to continue to harm your teeth, if you do choose to avoid any snack on this list, sticky chewy candy might not be best one to avoid (because it’s the worst one for your teeth). Related Article: It’s Halloween: Why is Candy Bad for Your Teeth? While finding better alternatives to some of the previously mentioned snacks isn’t a bad idea, your best course of action is to schedule your routine dental exams with Dr. Kimes at Overland Park Dentistry, and of course to make a consistent effort in practicing proper oral hygiene techniques on a regular basis. And please remember while the above-mentioned snacks can certainly lead to their fair share of problems if consumed in mass quantities, its certainly okay to partake in the occasional snack if done so in moderation. Life is stressful and hard sometimes, and there’s nothing wrong with treating yourself and taking joy in the little things. So if you choose to indulge in your guilty pleasure and enjoy the occasional snack or treat, just remember to do so in moderation, because if done too often, a little treat can turn into a big problem! Dr. Charles R. Kimes, DDS and his expert team at Overland Park Dentistry look forward to having the opportunity to care for you and your family with any preventative, restorative or cosmetic dental needs you or your family may have. To schedule your dental appointment with your Overland Park Dentist, contact us at our south Overland Park office at (913) 647-8700 or our north Overland Park office at (913) 341-2380.